Overstanding the mark is bad, but not as bad as having to short tack amongst your enemies. 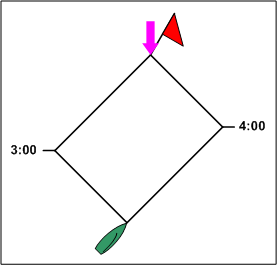 Sailing laylines are the final courses to the mark at the current wind speed and direction. They are calculated from the position of the mark, the true wind speed and direction, and your target angle and speed. 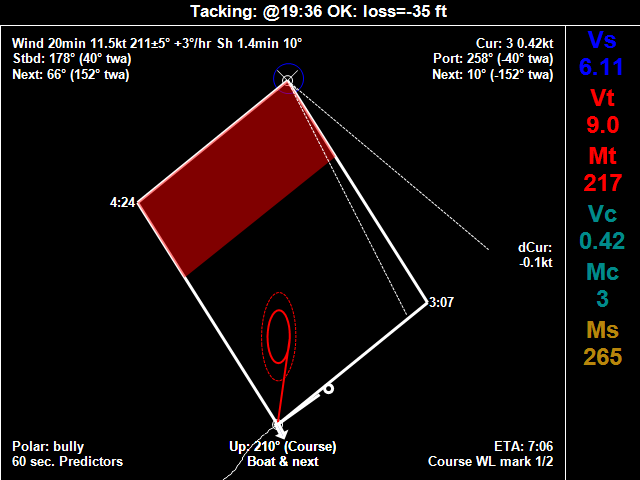 Predicting these sailing laylines accurately is critical. Wind shifts move the laylines back and forth, and changing wind speed balloons them in and out. This makes the corners move around. As you sail closer, the times count down. For sailing, laylines and the corners are the important thing. Once you have turned on final approach, you are committed. 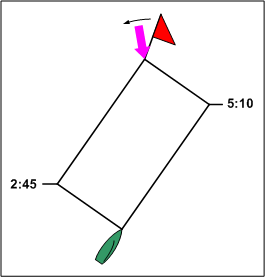 Here we see a basic sailing layline the way OS5 draws it. The boat has 4 minutes to go on port, and 3 after that on starboard. You could tack a few times before you gets to the layline, but the total time on port and starboard will be relatively constant. But when sailing, laylines are not static. The wind shifts them back and forth, and changing wind speed balloons the laylines in and out. This makes the corners move around. OS5 keeps a history of wind shifts, and attempts to show you the leftmost and rightmost positions the laylines are likely to take. As the wind shifts between leftmost and rightmost, the current corner moves up and down relative to the two extremes, giving you an at-a-glance view of how close you are to overstanding. 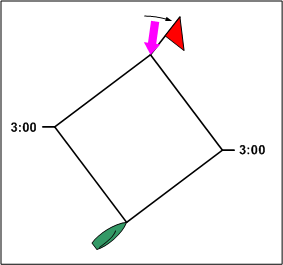 In sailboat racing, calling the laylines is one of the most challenging aspects. And keeping track of the changes that occur from wind shifts and wind speed changes in your head is virtually impossible. With Ockam sailing instruments you can have the information you need to choose your sailing laylines in a visual display, making much easier to make an accurate call. Here you see the Layline Fence which includes the layline limits.